When it comes to the full screen, you could first think of an all screen mobile phone, in which iPhone X is a full screen pronoun. This kind of mobile phone is charming with a large reading perspective and brings a brand new experience to the user, and then it becomes popular. 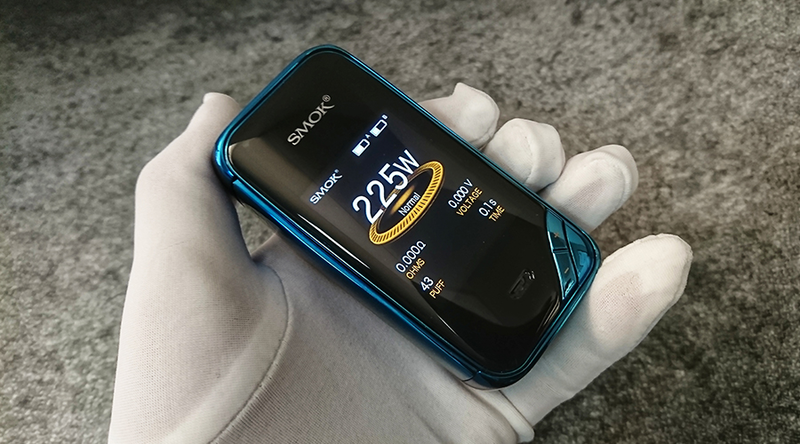 Recently, the famous brand SMOK also took the lead in launching its own “full screen” product, it is the SMOK X-PRIV suit, an equally attractive double electric suit like iPhone x. To be honest, I was really astonished when I saw the 3D rendering pic of SMOKX-PRIV on the box. Of course, this is just a preliminary impression on me of the rendering pics, and the real one will be revealed until opening the unique packing box. Under the temptation of the rendering pictures, I eagerly opened the package, and my eyes are brightened heavily by the vape pen suddenly. Yes, it’s good. It is really good. In accordance with the usual practice, I strongly pressed my heart’s excitement and involuntarily started check inventory list of products, including: 1*X-PRIV host, 1*TFV12 Prince nebulizer, 1* spare atomizer, 1* spare tube glass warehouse, 1*USB charging line, 1* accessories package, 1* product instructions, 1* security warning card, 1* warranty card. In fact, the development of electronic cigarette is like the cell phone. Nowadays, the appearance of vapes is gradually homogenized and the hardware is simply stacked up and the customers are tired of this. Therefore, manufacturers have changed the method of their thinking, looking for new breakthroughs, in order to make more outstanding products among so many manufacturers, SMOK is trying to improve the workmanship and hand feel of the product while aiming at the first human-computer AI window interaction. The apperance of SMOK X-PRIV is obvious, because it can be seen at all, and it gives me a feeling that it is a piece of art, which is simple and beautiful. Facing it, you can feel nothing, but if you can’t say it’s ugly, it only means that your taste is very poor. Because SMOK X-PRIV uses a compact design, the relative size will be relatively small. The size of 88*46.5*30.4MM, makes many players believe that it is a single battery vape, but when the back of the battery cover is opened, you will start to doubt your judgment, “this is clearly a dual battery vape.” The small shape is not only pleasing to the eye, but also has a good handle, and also has certain advantages in pocketing. Of course, a good handle cannot be simply determined by volume. The key point is to see how the corners of the main machine are polished and how the paint is handled. It is not difficult to find that the edges and corners of the SMOK X-PRIV are quite rounded in the picture, and the surface of the fuselage uses a mirror plating process. In addition, the whole panel on both sides has also made a slight uplift design, which not only makes the SMOK X-PRIV a more outstanding appearance, but also improves the feeling of hand. The comfort level is actually felt, close, full and smooth hand feeling. However, the mirror surface plating paint for players with sweaty hands, will feel a clear sense of slippery, also leaves fingerprints easily, staining dust eaisly. However, this kind of spraying technology in improving product appearance is quite awesome, its advantages outweigh the disadvantages. As mentioned above, the front of SMOK X-PRIV is basically covered by the whole black panel, so the whole machine is very simple. At the same time, the + – key is designed in the lower right corner without destroying the perception and keeping the player’s use. It can be said that this solution has found a good balance between practicality and beauty. In fact, the SMOK X-PRIV is not only full-screen coverage on the front, but also full screen covered on the back with some texture effect. This kind of honeycomb style pattern is added with the effect of pearlite paint, making the appearance of SMOK X-PRIV more perfect. In fact, the back side also acts as a battery cover. It adopts a strong magnetic adsorption connection method. Both its workmanship or interior decoration are full of care. At the same time, the fit between the connector and the fuselage is quite good. Using a large panel, the test is not only a workmanship but also a air tightness, because once the interior of the panel is stained with dust, it will seriously affect the beauty of the product, especially for the players who have obsessive-compulsive disorder. In fact, the air tightness of the SMOK X-PRIV is excellent, because I have owned it for 5 days, it has also been placed both in my pocket and bag. Except for the dust on the surface of the vape pen, the interior has always kept a clean state. It can be seen from the delicate workmanship of the SMOK X-PRIV. The use of large ignition key is the patent of SMOK. And the ignition key of SMOK X-PRIV has been innovated again. It is no longer rigid look, but fully integrated into the vape pen with a good hiding effect. If you do not specify, I believe that many players can not find the location of the ignition key. In addition, the designer also designed the ignition button on the right side for the first time, and I personally thought that this was mainly done to highlight the convenience of operation. The feeling of hand holding is very good. No matter the left hand operation or the right hand operation, it can be perfectly touched. In addition, the UI interface of the SMOK X-PRIV has changed compared to the recent product, showing a more modern style, and the system setting remains the same principle. The similarity of this setting can reduce the trouble of the player to adapt again. For specific setting methods, please refer to the relevant experience of the SMOK MAG suite in the official site. The old players could be familiar with the atomizer of SMOK X-PRIV. It is the TFV12 Prince nebulizer launched by SMOK at the end of last year. Outgoing, large capacity is its characteristics, good taste, and great smoke is its nature, the patented lock system is its safety magic, what’s more, it not only supports 4 kinds of finished products atomization core, but also support RBA components, which is very important to the hands-on players. Of course, if you feel Prince TFV12’s nebulizer is too large, use your own commonly used head nebulizer, because the body of the SMOK X-PRIV is also perfectly matched with that.